One event the Australian access industry has really come to look forward to is the Genie Customer Appreciation night, held on the eve of the annual HRIA convention. The leading access equipment brand has established a tradition of whisking its customers away to a secret and surprising destination. First-class dining, drinks and entertainment are turned on, and a fun time is had by all. These nights are a way for Genie to thank its customers for their support during the year, an opportunity to renew old contacts, and kick the convention off with a bang. 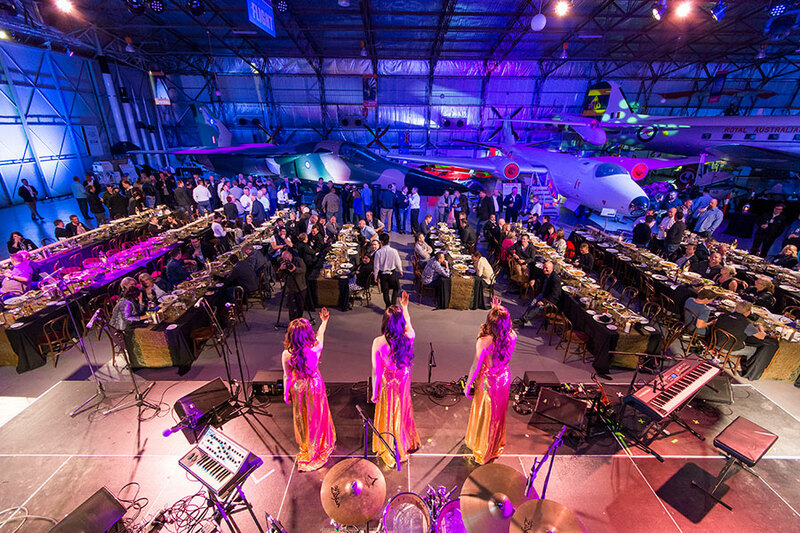 This year, the HRIA Convention was held in Adelaide, guests were bussed from the Adelaide Intercontinental hotel to this year's secret destination, the South Australian Aviation Museum. After arriving outside the Port Adelaide venue, while guests enjoyed refreshments, an incredible roar set up as an almighty free-standing, fire-spitting Rolls-Royce Merlin V12 engine, the powerhouse used in the fabled Spitfires, was cranked up and gunned, transporting the rev-heads present — of which there were many — to horsepower heaven. Then, with guests’ ears ringing, the big hangar doors slid open and everyone piled into the cavernous museum. What a great venue it proved to be — Genie had once again chosen an excitingly different and original place to hold its annual bash. The South Australian Aviation Museum, opened in 1984, is a truly fascinating place with some iconic aircraft on display from Australia's military and commercial aviation history. These include a 1929 wooden-framed Gipsy Moth biplane; a 1942 Spitfire, one of the most revered fighters of all time; the Australian-produced Jindivik military target drone; a Douglas DC 3/Dakota, one of the most reliable planes ever built; and a 1963 Westland Wessex anti-submarine helicopter. Probably the star attraction, though, is the awesome, swing wing F-111 strike bomber, which looks much bigger and way more intimidating in the flesh than in photographs. Delivered to the RAAF in 1973, this plane saw service until 2010 and was capable of 2,655 kph. It takes pride of place in the museum and dominates it with its menacing presence. Another great feature of the museum is the ability to go aboard some of the aircraft and inspect their interiors and cockpits, which many guests did during the course of the night. Meanwhile some New Orleans—style bluesy jiving jazz was being pumped at high energy by the 10-piece Big Ol' Bus Band, fronted by the slinky and swinging Cherote sisters. This gave way to a sophisticated performance at the piano by Mat Verevis — who most guests recognised from his superb rendition on The Voice last year of Billy Joel’s “New York State of Mind” — as dinner was served at long trestle tables evoking an officer’s mess. After a great meal, it was time for Brad Lawrence, General Manager of Terex AWP, to say a few words. “Genie is proud to be the Platinum sponsor of the show this year, and we have on display a record number of new products designed to improve your bottom line,” said Mr Lawrence. Acknowledging tough times for the industry, Mr Lawrence said, “I have never seen rental rates as low as they are now, and whilst most of our customers are reporting quite high utilisation, I am not seeing much upward movement in rates as a result. “We need to react to what is now the norm. Genie is committed to offering better value to help hiring companies’ ROI. It starts with designing products that make you money, period, rather than adding all the bells and whistles your customers may want but not be prepared to pay for. “Another focus for Genie has been on designing new and different products that provide unique working opportunities for your customers and have been commanding a higher rental rate. “Genie also ensures your equipment is always out there working for you. We are committed to world-class parts fill rates and service support where and when you need it. And we continue to expand our service training and tech support so if your equipment does break down, we can get it fixed quickly,” Mr Lawrence concluded.